What a great break we had with the weather at Sean’s Run. After such a wild week of heavy rain, even hail, blue skies prevailed throughout the run making for a perfect day for both runners and walkers along the springwater trail. Once again, or corporate sponsors and large dollar donors paved the way for another financial success, as well as bringing participants for the run itself. So, a tremendous thank you to Goodwill Industries of the Columbia Willamette, Umpqua Bank, Downtown Dental Associates, Neil Kelly, Arbonne, Team Reliv, individual donors and sponsors of Sean, and the employees of New Seasons Market Concordia store! Sean’s Run began in 2007 as a community event, and as a minor fundraiser, raising money for small projects. 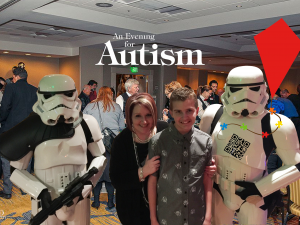 Today it stands as the signature fundraising event for ARROAutism, a fully certified 501(c)(3) not for profit organization whose projects include an annual Holiday Family Assistance Project, programs, lectures, events, Autism Research and more. ARROAutism’s long term vision is to create a center of Excellence in Autism. Thanks to all the donors, volunteers, sponsors, and your participation in this year’s run, we were able to raise approximately $5600 to continue to provide these invaluable services to the community. We hope you had a fantastic time at this year’s run, and we can’t tell you enough how important a difference you make to the community at large. Have a great year of running, and we look forward to seeing you again at the next run! This entry was posted in Race Results, Sean's Run for ARROAutism, Seans Run From Autism. Bookmark the permalink.